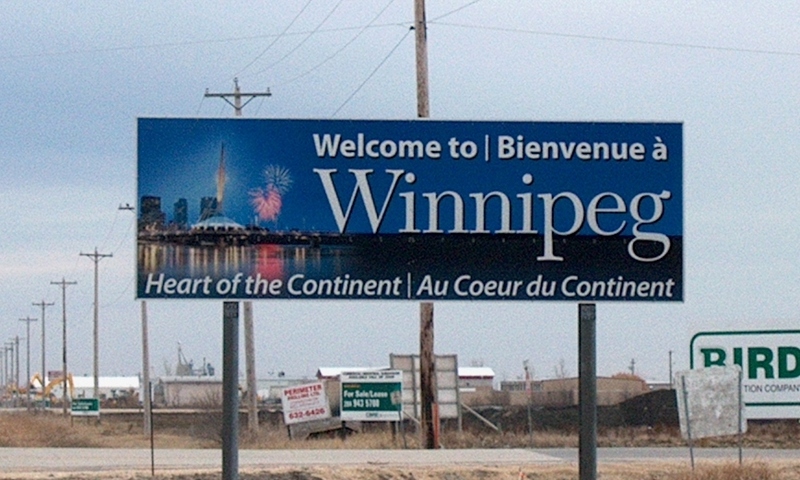 Road sign saying “Welcome to Winnipeg!” WIkimedia Commons. “One Great City!” is hardly the only song by The Weakerthans that is either directly or obliquely about Winnipeg. Over the course of their four albums together, they wrote song after song about the prairie city. In 2012, Samson released his first solo album, Provincial, at the same time that he published Lyrics and Poems, 1997-2012, his first poetry collection. Provincial explores four highways in Manitoba and the people, stories, and ghosts that live along them. One of the songs on Provincial is called “Heart of the Continent,” and is written as a companion song to “One Great City!” Both songs take their titles from Winnipeg slogans, and meditate on the experience of living in the city. 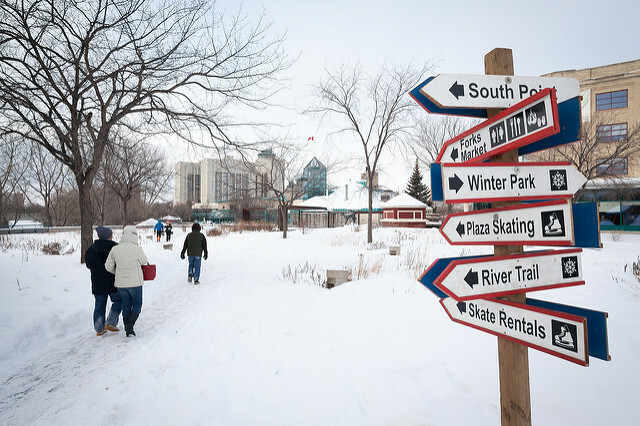 Choose two songs written by Samson about Winnipeg or Manitoba from the list below, and compare and contrast the ways in which the city or province is represented. Make sure to ground your reading in close analysis of the lyrics, consider how the song’s music informs your interpretation, and bring in at least two scholarly sources of your own choosing. In each song, consider the following: Who is the speaker? Where do they live? What is their occupation? How do they feel about Winnipeg/Manitoba? How do the differing answers to these questions inform your reading of the songs? How do the themes of power, place, and identity play out in the songs you chose? How can you relate each of the song’s lyrics or music to some of the concepts you’ve discovered in your scholarly reading? Downtown Winnipeg in the Snow. AJ Batac, CC BY-NC-ND 2.0, via Flickr. Choose a song written about a city, town, or place that you feel “local” to, and analyze the roles that power, place, and identity play in the song’s lyrics. Please attach a copy of the lyrics to your assignment, and refer to the questions from Assignment One to guide your analysis. Make sure to reference at least two examples of relevant scholarship on place, locality, power, identity, or poetry to reinforce your claims. Throughout your analysis, you should consider whether the song echoes or represents your experiences of and feelings about the place it is describing, or if it is at odds with them. What are some of the factors that might affect these similarities and differences? Bernstein, Charles, ed. Close Listening: Poetry and the Performed Word. New York: Oxford UP, 1998. Print. Hawkins, Stan. Settling the Pop Score: Pop Texts and Identity Politics. Aldershot: Ashgate, 2002. Print. Kamien, Roger, and Anita Kamien. Music: An Appreciation. New York: McGraw-Hill, 1988. Kramer, Lawrence. Musical Meaning: Toward a Critical History. Vol. 1. Berkeley: U of California P, 2002. Print. Moore, Allan F. Song Means: Analysing and Interpreting Recorded Popular Song. Aldershot: Ashgate, 2013. Print. Negus, Keith. “Authorship and the Popular Song.” Music and Letters 92.4 (2011): 607-29. Print. Samson, John K. Lyrics and Poems, 1997-2012. Winnipeg: Arbeiter Ring, 2012. Print. Sterne, Jonathan, ed. The Sound Studies Reader. New York: Routledge, 2012. Print.